A group of college students, including Allison (Katrina Bowden), Chad (Jesse Moss), Chloe (Chelan Simmons), Chuck (Travis Nelson), Jason (Brandon Jay McLaren), Naomi (Christie Liang), Todd (Alex Arsenault), Mitch (Adam Beauchesne) and Mike (Joseph Allan Sutherland), are going camping in West Virginia. While at a gas station, they meet Tucker (Alan Tudyk) and Dale (Tyler Labine) two well-meaning hillbillies who have just bought the vacation home of their dreams: a run-down lakefront cabin in the middle of the woods. Dale tries to talk to Allison but because of his inferiority complex and appearance, he only scares her and her friends. 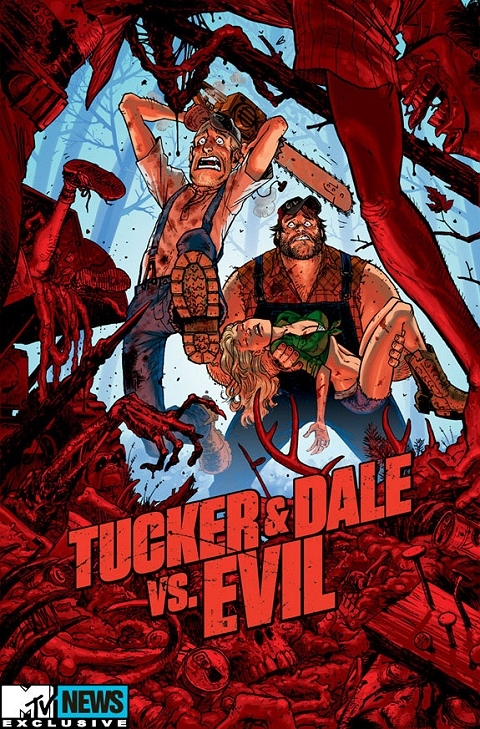 Tucker and Dale soon continue to their run-down, derelict cabin and are delighted in their new home despite structural hazards resulting from the building’s state of disrepair. Meanwhile, in the nearby woods, the college students have set up camp. Chad tells everyone a story recounting an event known as the “The Memorial Day Massacre,” which took place twenty years previously in the same section of the woods, leaving only one survivor. Soon after, the group decide to go skinny dipping in a nearby lake. Also on the lake are Tucker and Dale who are fishing. Allison spots them, and startled, falls into the water and hits her head. Tucker and Dale save her, but the college kids think Allison is being kidnapped.